The islands of Koufonisia are in fact a complex of consisting of two islands; these are the island of Pano Koufonisi which is settled and has a lot of tourist amenities, and the island Kato Koufonisi which is entirely unoccupied and can be visited only for a beach trip from Pano Koufonissi. Situated between the beautiful Cycladic islands of Naxos and Amorgos, Koufonisia islands are a wonderful place for leisure, fantastic for walking and cycling. There are many incredible beaches to visit and some of them are nudist areas. In fact, most of the activities in Koufonisia are concentrated in Chora, where you can find the most facilities for accommodation, taverns and shops. 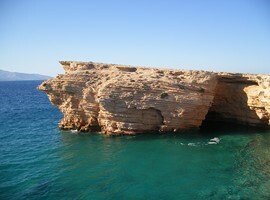 Tourists can go there for holidays or for a day trip from Naxos and Amorgos. 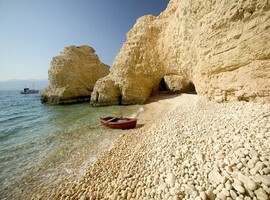 The islands belong to the complex of the Small Cyclades, along with the islands of Donoussa, Schinoussa and Iraklia. The town of Koufonisia or also Chora is known as a small fishing village and it is the initial point for a considerable number of tourists to Koufonisia. It is the port of the island and is a leading instance of the conventional Cycladic architecture while the tourists always enjoy the many facilities on the island, together with the hotels, taverns and shops which are indeed available in this small town. The primary pathway alongside the road by the sea is where all the action is focused. Tiny shops selling local products or comfortable taverns, are all obtainable there. The beach known as Megali Ammos at the harbour is a grand place for a cool dive in the emerald sea, being pleasant, clean and not too much populated. It is notable that the islet of Keros is situated almost in the centre of the Cyclades islands, next to the shores of Koufonisia. Even though it is a tiny islet (only 15 sq. m.), it is historically remarkable. During the ancient times, a pro- Cycladic civilization was flourishing there between the 2800BC-2300BC. It should be particularly noted that the marble statues, the utensils made of stones and ceramics, the obsidian blades and the many graves had been found on Keros. These findings are still kept and preserved in the National Archaeological Museum of Athens, the capital of Greece. In the ancient times, the island was called Keria. A number of scientists still are of the opinion that this was the holy place where the goddess Artemis was born. According to the Greek mythology, Leto, the mother of Artemis and Apollo gave birth to Artemis first on an island and then she travelled to Delos to give birth to her other child, the god Apollo. That’s why it is thought that religious festivities used to take place on the islet of Keros. The centuries that followed the Neolithic Era, Keros was however abandoned but it was again used by the pirates in the Middle Ages as a sanctuary. Today, the islet is unoccupied. However, its infertile countryside has encouraged many artists, like Pablo Picasso and also Henry Moore. Close to Keros, there are also some other isolated islets, such as Daskalio and Antikeros, where archaeological findings still exist to gift their glory to the place. The Megali Ammos beach is the key beach of the port of Koufonisia and that it is fairly admirable, because of its clarity and purity. This is, however, not much crowded. It is ideal for those who look for peace and tranquility under the sun, next to the cool sea and the golden sand. Located in the eastern part of Chora, the Finikas beach has been popular and known as the one of the best on Koufonisia. The Finikas beach, which is one of the four beaches that appear to amalgamate into each other. It is not easy to discover where one ends and where the next one starts. One of the best ways to reach Finikas is of course, on foot. Taking a beach boat you can also reach here. It is recommended that you walk through it as the hike comes lively with experiences on the southern coast. Moreover, it is just a 15 minute walking distance from Chora but you will not be disappointed; the beach of Finikas is indeed a small sandy beach but really magnificent. The water has a deep blue colour while on the beach you can find a tavern too for the ‘’hungry moments’’. It is wise to take some time in hand so that you can enjoy a comfortable day, swimming and taking pleasure in the sun and the sandy beach. 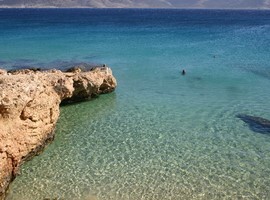 Platia Pounda is one of the most popular beaches on Koufonisia. It is primarily a nudist beach but even if you wear clothes you would never feel like a fish out of water! It is noticeable that there are people who are wearing clothes, semi dressed and not wearing clothes at all milling about, enjoying themselves a lot..! It is observed that the most of the beaches in Cyclades have clean soft sand, eye-catching panoramic view and stunning sunsets along with the Greek generosity of the people who are always friendly. In addition to that, there is even volleyball net in the middle, for the sport fans. The Platia Pounda is also a fine beach for spending leisure when the Meltemi is blowing (Meltemi in Greek is the strong summer northern winds). The water is clear, and swimming here is really an unforgettable experience. There are many realistic reasons about why you should visit the two beautiful islands of Koufonisia. Many words may be said to explain them, nevertheless, to tell the truth they defy explanation. Words fail to give an exact illustration of the magic that the visitors experience from the very beginning of placing their foot on the Koufonisia islands. The Aegean Sea, the warm sun, the golden beaches, and the turquoise waters where the sea sculpting the rocks into exceptional shapes and the sea caves from whence the names of the islands are imitated (Koufonisia – Hollow islands). It should be noted in particular that the neighbouring Keros captures the eye and the friendly, hospitable, generous people make you feel as if you were part of a huge cheerful group. 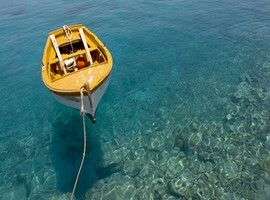 The islands of Koufonisia have fanatic friends, whoever enjoy a taste of the unusual beauty; never give them up at all. Really, for many years, the persistent vacationers intended to conceal the target of their vacations. To conclude, it should be stated that the years went by and the secret has gotten out, a lot of people have learned much about these islands and hence you will entirely feel lonely. It is notable that almost every year new visitors arrive in the port of the islands. And new accommodations are usually constructed such as hotels, apartments, studios, and rooms to rent to meet their requirements. It is important to mention that Koufonisia have just entered the tourist’s list. Nevertheless, every image and indication of the old way are still noticeable. The magic and the positive energy are still there, and it still makes people to realize that they are fortunate enough having discovered this secret paradise on the middle of the Aegean Sea, the Cyclades islands.